Art is the composite expression of human creativity and thought process, and usually in an imagery form such as drawing, painting, posters, graphic prints, sculpture or craft or any functional artistic creation, producing works to be appreciated primarily for their beauty or emotional power. As art is the one universal language which consist of the physical and conceptual nature or we can say the combination of both form and content. Overall child development through Art ActivitiesArt may be considered as a fun or hobby games like activity and undoubtedly, it is. But the parents or the mentors may not realize that the child is actually learning many things on different ground levels of their physical, mental, sensory and emotional through exploring the arts and doing creative activities. The child will achieve constructive ability through art, because it is the only activity which takes them beyond this physical world and opens their imaginary doors to think beyond, create their own ideas and meanings, helps in their motor development and emotional power. So encourage them to get into some creative activities, construction of their own ideological world, with their own colors and forms and the child will achieve many skills like Communication Skills, Motor Development and Social & Emotional Skills.Communication SkillsWhen child is involved in drawing a tree, paint a sun, or assemble many waste materials in form of a lion or a robot, the child starts communicating visually. May be all these things doesn’t exists as it is in this physical world, but yes it seems to be like that, as the objects and their forms are explored by the child’s own eyes and so that the Artistic creation goes beyond verbal language to communicate feelings and emotions that might not be expressed in other way.Motor SkillsWhile the child is involved in art activities, he is capable to do such things like carefully turn the pages of a book or fill in a sheet or specific space of paper with written words. 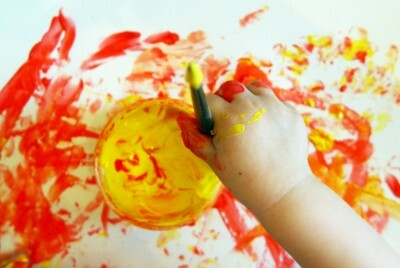 Carefully holding a brush, with colour so that it will not ruin the paper, construct the preferred form, cutout the particular shapes out of paper with scissors, drawing with a pencil, charcoal, sketch pen, brush or crayon, or squeezing glue from a bottle with a controlled handling and many things which help the child in physical motor development.Social & Emotional SkillsAs the children involve in creative activities and building new things, they are so much engaged with themselves and they understand the control and handling on their efforts. They have their inbuilt courage and dedication starts while connecting with the artistic creation and discovery of new things. Through art, they also perform sharing and well behaviour, as well as giving value and feeling happy at one another’s efforts, as they understand the process behind. Art promotes the beautiful and positive mental health by allowing a child to show individual capability as well as achievement and completion, all impart into positive self building.